The Speaker, John Bercow, was in Hull today to deliver a Parliamentary Studies Lecture on ‘Why Parliament Matters’. The University is one of twenty accredited for the delivery of such lectures by clerks of both Houses and the Speaker’s was the last of this semester’s lectures. 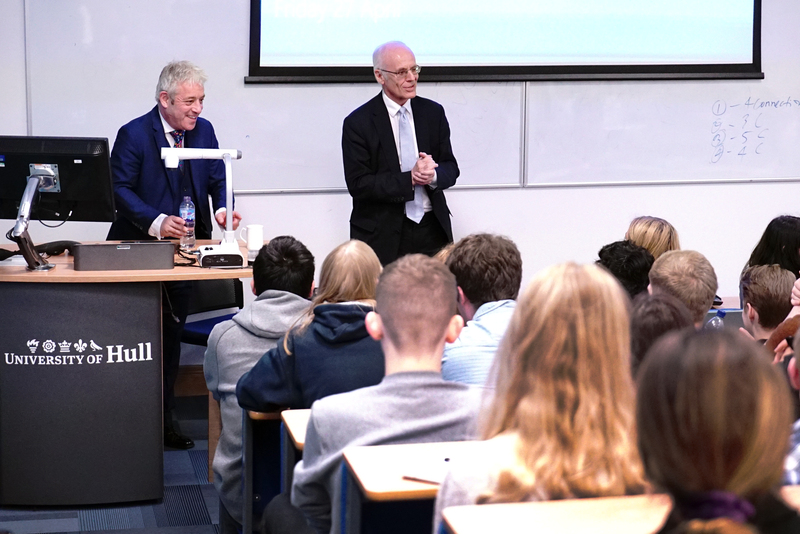 Addressing a packed lecture theatre, he argued the case for strengthening the House of Commons in relation to the executive as well as making the membership more representative of those it sought to serve. He noted that before he became Speaker in 2009, it was rare for Speakers to grant an Urgent Question. Since his election, he has granted 460, designed to bring ministers to account on the pressing issues of the day. He welcomed reforms of recent years, not least the election by the whole House of select committee chairs, the election by the parties of members of the committees, and the creation and work of the Backbench Business Committee. He also advocated government business being scheduled by a business committee and favoured reform of the way in which Private Members’ Bills were considered, allowing the House to vote on them rather than being tal ked out. He was open to the idea of proxy voting. He also emphasised the importance of education – he was instrumental in achieving the building of the Education Centre near the House of Lords, in Victoria Tower Gardens – and the value of outreach. He enjoyed visiting universities and saw such visits as an important part of his job. This entry was posted in Uncategorized and tagged House of Commons, Hull Politics Department, John Bercow, Parliamentary Studies Lectures, Speaker of the House of Commons. Bookmark the permalink. Hard to comment without a transcript but generally Bercow has been a poor speaker who has done the office few favours. OT: Did anyone else chuckle at one of the recent headline that asking individual to show they have a right to vote undermined democracy. I see the ‘proof’ on the trials is a very low bar. Bercow’s predecessor, The Lord Martin of Springburn, just died. In which way is he pressing for the House of Commons to be more representative of those it seeks to serve? Exactly and specifically, what is he wanting to expand on that the HoC doesn’t presently have? Could it be intellect and an ability to articulate? The way so many we presently have representing us show? What we don’t need in government is a composite of the average guy. There are enough average ability, sitting wide legged, on those benches already. Enough to make you shiver with fear. Without derailing this article too much, I must point readers to the stories emerging from several channels about Mr Bercow’s conduct.